Superior Transmissions Inc., Cedar Springs, MI is an ATRA Member in good standing. 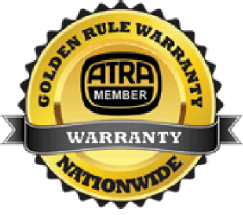 Automatic transmission overhauls, with some exceptions made known at the time of sale, will be protected by the nationwide 1 year/12,000 mile ATRA Golden Rule warranty. If you are out of town and experience a problem, take your vehicle to an ATRA Member shop and they’ll check your vehicle. Members normally include the ATRA logo in their phone book ads. You may also check www.atra.com or call (866) GO-4-ATRA. Note: This warranty is limited to replacing the transmission or parts thereof which upon our examination prove to be defective. It does not include breakage of gears, damage resulting from abuse, faulty operation of any part or parts not furnished as part of the original transmission repair (such as linkage, clutch assemblies, shifters, motor or transmission mounts, worn or defective driveshaft components, pilot bearings or bushings, tires and wheels, or electric components etc. ), accident or racing. Units will not be covered under warranty if they are run out of lubricant, underfilled or overfilled with lubricant, or filled with the incorrect lubricant. Upon request, a copy of the written ATRA warranty will be provided for inspection prior to any work being performed. All of our completely rebuilt transmissions include a 12 month/12,000 mile warranty (whichever comes first) against failure by defects in materials used and work performed to your vehicle. Extended warranties offer you and your family peace of mind for many years to come!